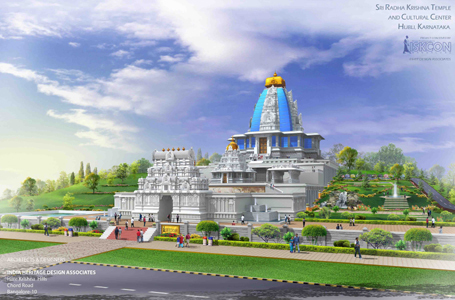 ISKCON will be launching its master plan Project “Sri Sri Radha Krishna Mandir & Bhaktivedanta Heritage and Cultural Complex” in line with ISKCON Temple in Bangalore at Rayapur, Hubli-Dharwad. It will be Glory of India and Pride of Karnataka. 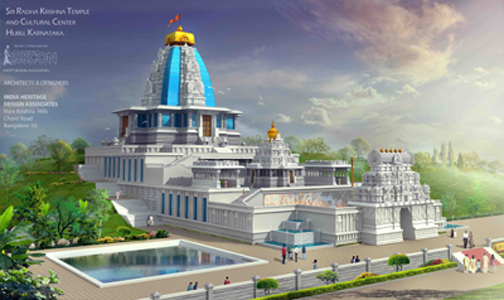 The Projects Architectural master piece will be designed by a team of Architects led by Sri Madhupandit Dasa, President, ISKCON Bangalore, who has designed the famous ISKCON Bangalore temple. The phase one of the project “The Akshaya Patra Kitchen” is already ready & is built at the cost of 14 Crore and has a capacity to cook food for 2,50,000 children at a time. At present 1, 80,000 underprivileged children are covered in the scheme. 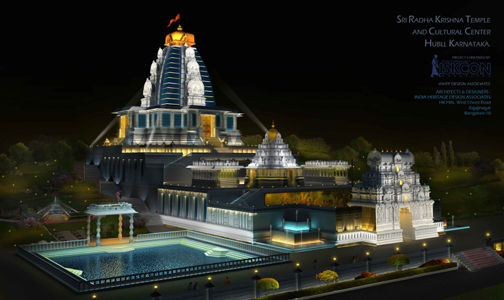 Apart from Akshaya Patra, & a temple of Sri Radha Krishna, the proposed project in Hubli- Dwd will include the following. The Grand Cultural complex will showcase India’s glorious tradition of Art, Architecture and Valuable Heritage. 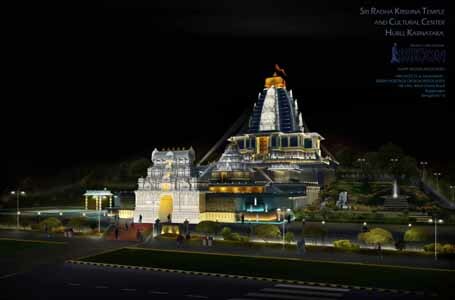 The Complex will bear a unique blend of Traditional Hoyasala and Modern Architecture, a beautiful synthesis of traditional South Indian temple architecture and modern facilities. The complex will be garlanded by lush green, serene garden and landscape. The Musical fountain will have brilliant fusion of light, sound and water amidst beautiful landscape, with colourful gardens and verdant lawns. Inculcating Values through technology. The Complex will house a state of art multimedia theatre which will showcase the values of Vedic culture through films, light and sound shows, Video & Audio animatronics. It will have a capacity of 300 people at a time. Enchanting India is a treasury of art, architecture; philosophy, classical dances and music. India is colorful and vibrant, a land as diverse as its people. It has mosaic of faiths, cultures, customs and languages that blend harmoniously to form a composite whole. It is one of the world’s oldest living civilizations. To give a glimpse & to teach these important values embedded in our Vedic heritage, the Complex will house a Heritage Auditorium & Open Air Theatre with a capacity of more than 500 people each. Showcasing the Glorious heritage through Entertainment. There will be spectacular Walk through experience, Educational boat rides, in themed settings of animated dolls, light, sound and special atmospheric effects. Apart from the Akshaya Patra program, all the pilgrims to the temple will also be able to have Sri Krishna Prasadam at the temple in Annadana Mantap. This will have a capacity of thousand people at a time. Japa Yajna for World Peace & Harmony. The Complex will have a unique program to make thousands of people chant at least one round of the Hare Krishna maha mantra everyday at the temple for World Peace & Harmony. The Harinama mantap will be designed in South-Indian style, and will have two sets of 108 steps. A recorded voice of Srila Prabhupada chanting the mahamantra with full clarity, will resounds in the mantap, playing off a CD. One full round will take exactly 10 minutes – meaning that 1296 people can pass through the mantap in an hour, each chanting the mahamantra 108 times.